We all know that our country’s wildlife is getting increasingly put-upon by growing urbanisation and commercial agriculture. So what can we do to help? 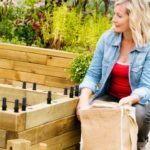 Well, there are a number of very simple and easy steps to take that will not only lend a hand to the wildlife, but also bring some excitement to our gardens as well. Bees are increasingly under pressure, so why not plant some good plants for nectar? Often bees get stranded when out looking for food, so providing a little staging post will allow them to recharge their batteries and make it home to the hive. This is especially important in early spring and autumn when the weather is a bit cooler (affecting their energy levels) – so include plants such as primroses, lungwort, asters and sedums, as well as summer flowers such as cosmos and Echinacea. These are of course just a few suggestions – there are many more flowers suitable for bees. When choosing your plants, keep the bees in mind by going for open flowers. Many of the modern hybrids have double flowers with so many petals that it’s impossible for the bees to get to the nectar in the centre. Daisy types are especially useful, but there’s a list supplied by the Royal Horticultural Society (RHS) that details good plants by type and season (https://www.rhs.org.uk/science/pdf/conservation-and-biodiversity/wildlife/rhs_pollinators_plantlist) and look for the ‘Perfect for Pollinators’ symbol on plant labels. When planting for butterflies, think ‘landing pad’ – they prefer flower types that have a large, flat top like yarrow and sedums, which give them space to land and drink the nectar. Again, refer to the RHS list for appropriate choices. Finally, if you include some plants that not only provide nectar in the summer, but also seed heads in the winter, you’ll get some bird visitors as well. With all this going on in the garden, it’s a shame to miss it. Watching wildlife going about its daily business is a great way to relax and forget about the worries of the human world, and so planting in raised beds allows you to get that much closer to the action, without getting muddy or grassy knees! Alternatively, for a front-row seat, why not add a raised bed with integral seating or a bench with planters at either end? WoodBlocX have a number of kits for both of these options, or you could use their free design service to create a bespoke bed or seat to turn your garden into a wildlife theatre! WoodBlocX uses only sustainably-sourced timber, and other components are created from recycled materials, so its environmental credentials are already very high as all its products are certified by the Soil Association.